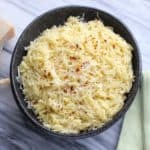 If you’ve ever searched for a healthy cauliflower recipe, you’ve probably heard about the “cauliflower mash” craze. Basically, you just puree cauliflower with some butter/spices/etc. and it’s a healthy swap for mashed potatoes. I’ve made it before and it’s pretty good… but I knew it wouldn’t pass the test for my potato loving midwestern husband. So I thought I’d trick him. Ok, I didn’t really trick him. Mostly because he was in the kitchen when I was chopping the cauliflower. He was on to me. But that really just makes this recipe all the more impressive. He knew there was cauliflower in it and he still liked it! The trick? A compromise. Half cauliflower, half potato. A little bit of the healthy stuff, a little bit of the real stuff. The result was delicious! Make about 4 1/2 cup servings. Dice the potato into one inch chunks. Chop the cauliflower into large pieces. In a large pot, add the potatoes, cauliflower, and 4 cups of water (or enough to cover the veggies) and bring the water to a boil. Once it’s boiling, turn down the heat but continue to simmer. Cook for 8-10 minutes or until the potatoes and cauliflower have softened. You can test it out by poking a piece with a fork. It should be easy to pierce but not mushy. 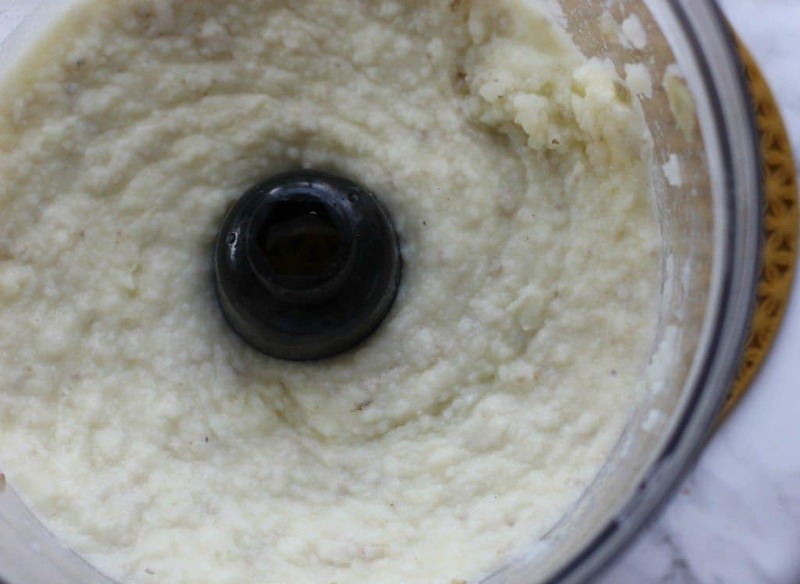 Drain the potatoes and cauliflower and transfer to a food processor. Add in the onion powder and salt. If you’re wondering where to buy Edam cheese, truthfully I had some of those mini Babybel cheeses that I needed to use. I checked to see what kind of cheese it is and apparently it’s similar to Edam or gouda. If you don’t have either of those on hand, you can likely omit it and just add a splash more milk but you might also want to add a little butter just to give it a little more creaminess. While I generally use almond milk in recipes, I do recommend skim milk for this. It helps with the structure of the mashed potatoes. I was actually impressed with how delicious these were. You can’t taste the cauliflower at all. This would be a perfect way to sneak in some extra veggies, even if you have a cauliflower hater in your life. 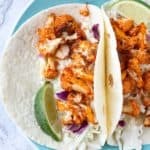 Need more ideas for cauliflower? Here are 10 ways to use cauliflower crumbles! 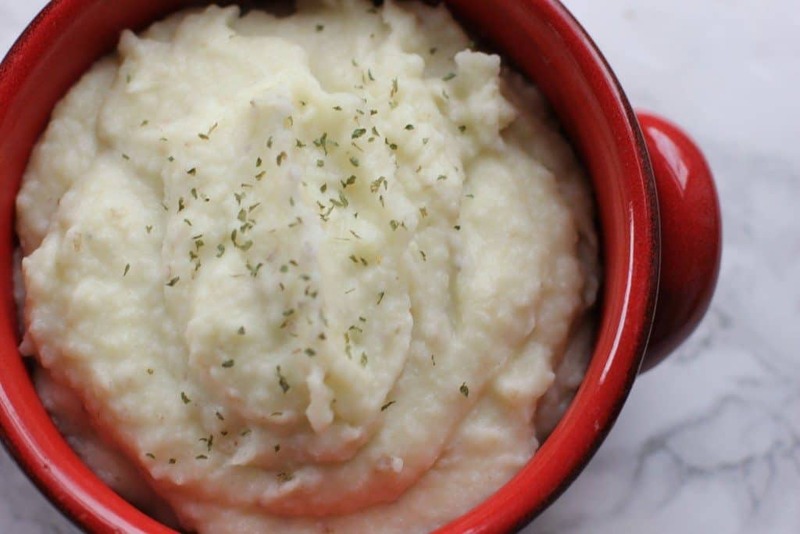 Or if you’re in the mood for more traditional mashed potatoes, try these easy goat cheese mashed potatoes. What’s your favorite way to use cauliflower? 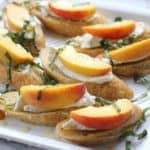 Love the idea of adding in gouda! I do a half & half mix with potatoes also, and usually “mask” it with garlic or horseradish (still yummy), but have always resorted to normal potatoes when I’m feeling indulgent. With the cheese, I bet I could still do the half/half. Thanks for the idea! This looks delicious! 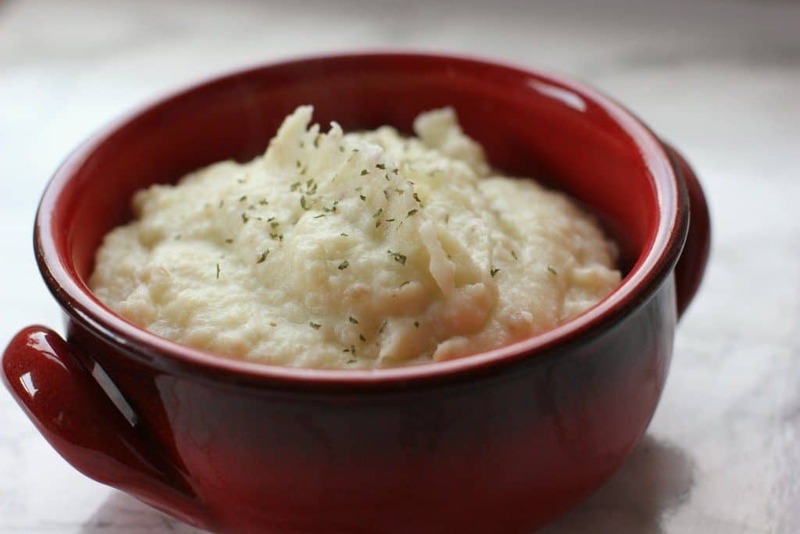 I love cauliflower puree and am totally fine with it as a substitute for mashed potatoes, but then again mine isn’t anywhere near healthy once I add all the butter, cheese, and cream. I love that you combined the two together! Great “trick” to use! I’ll have to give it a try sometime! This sounds very gouda! Love the idea of half potato half cauliflower. If your hubby liked it, I bet I can fool my family too! Pinned. This is very creative! I wonder if vegan cheese would still make this creamy enough? I’ve made this before and love the half potato/half cauliflower. I’ve never made it with cheese though! Yum! Can’t wait to try this recipe this weekend. 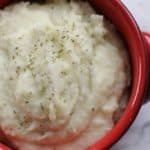 I’ve been wanting to try to make cauliflower mashed potatoes, so this recipe came at the perfect time! I’m looking forward to trying it! Love this! I’ve never made straight cauliflower mashed “potatoes” because I know my husband probably wouldn’t go for them. This is such a great compromise! Sadly we are a divided house on cauliflower. I love it, hubby hates it and the little man is still undecided about most veggies in general. Such a good idea–to blend the best of both worlds! I’ve made cauliflower mash just with steamed cauliflower, olive oil, salt and lemon juice (and blend) but never with cheese YUM! oooooh I want to try this before (Canadian) Thanksgiving! yayyy to more veggies + cheese 🙂 i have made it once long time ago and it was pretty good but not great. i will have to revisit them soon. I never thought to add cheese to my cauli mash. Especially gouda. Yum! oooh, so you still put potato in here! I bet that helps give it a little bit more of a potato flavor! It’s hard to pass just cauliflower mash as mashed potatoes. But this is a great idea to cut back on some carbs but still get that potato flavor! This is great because we have half a head of cauliflower, and I think maybe I’ll try this tomorrow for after church. It looks absolutely delicious and exactly like regular mashed potatoes. MMM how delicious!! I love cauliflower mash, I also love making my cauliflower roasted in the oven with fresh herbs. I think I need to add cauliflower to the grocery list now! Thanks for sharing! Muwahaha, good idea to trick the guys 😉 Adding a white potato is a smart idea. Can’t wait to try out this version of cauli mash! 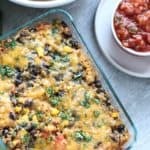 This looks so delicious – and the cheese addition would add SO much flavour!